At a Democratic rally in Ohio on Tuesday, President Obama had a bold message for men: Make sure that sexism — conscious or subconscious — isn't affecting your vote for president. Urging men to "look inside" themselves, Obama encouraged male voters to re-think Hillary Clinton as a presidential candidate. I want every man out there who's voting to kind of look inside yourself and ask yourself if you're having problems with this stuff, how much of it is that we're just not used to it? The president's message seemed to liken this year's election between Clinton and Donald Trump to the 2008 election, where, for the first time, voters considered an African-American candidate for president. Obama was able to win over a majority of voters back then, and again in 2012, but can a woman? That answer won't be clear until Election Day, at the earliest, but as the last week of campaigning kicks off, Obama's message came as a poignant reminder. Hillary Clinton is consistently treated differently than just about any other candidate I see out there. 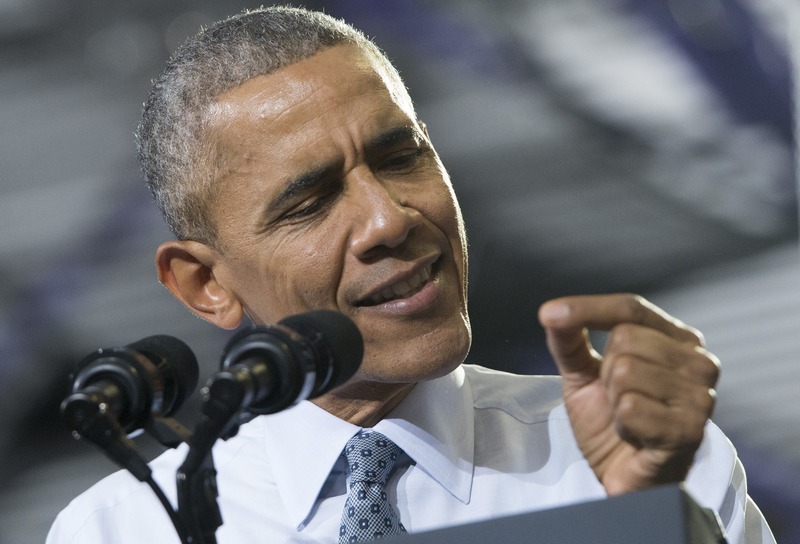 According to The Columbus Dispatch, Obama addressed a crowd of about 5,800 people at the Capital University indoor sports complex in Bexley, Ohio. A key swing state in presidential elections, Ohio — and the president's words there — could potentially give Clinton an important boost in the vote next week. While Clinton's gender is obvious and very much talked-about, the president's message points out that voters' biases might not be as visible. In other words, it's not that Obama thinks male voters are sexist. Rather, he has challenged them to recognize Clinton's gender and respect it, not shy away from or discredit it. In short, he seemed to imply that biases against Clinton may be subconscious, but they're still worth talking about and casting aside. Ultimately, no matter what type of voter you are, gender shouldn't be the only determining factor in your vote. Just as women shouldn't necessarily vote for Clinton because of her gender, men shouldn't discredit Clinton's candidacy because of her gender. Instead, there are her years of experience and her many policy proposals to consider. In typical Obama fashion, the president couldn't get his point across without a nod to his own powerhouse wife. "I know that my wife is not just my equal, but my superior," he told the Ohio crowd. The crowd won't be voting for Obama or his wife next week, but it might just miss them when they leave the White House next year.